For our Jan/Feb kitchen issue, we asked local design professionals their thoughts on waterfall edge countertops in the kitchen. Here is what the experts had to say. “The waterfall edge is a very nice transitional -to-contemporary design element but definitely a CRAZE!” Chris Powers, Alspaugh Kitchen & Bath. “Hesitantly, this trendsetting feature of kitchen design would be categorized as a craze. It’s become quite popular lately, and if done well, it’s so amazing! It’s not classic, as it hasn’t been around for a long time, but I hate to label it as a total craze because it can be modified into even new and more varied applications. However, it does create functional challenges, such as the code requirements for receptacles in islands. I think it’s exciting to take the idea of stone on the end of an island and do it in a way that is fresh and designed specifically for a home.” Anne Boedges, Anne Marie Design Studio. “I think it is a craze. While I do love the look of the waterfall and have used it, the look is great for sleek, contemporary spaces, not for traditional spaces. Many installations require the end cabinet be open or have storage behind a door. The end cabinet often is the introduction to the cabinet color and style.” CJ Knapp, Yours by Design. “Definitely a craze. This is not something you can find in any historic home. I believe it will stay in fashion for a while, propagated by the stone and quartz suppliers and manufacturers, but is unlikely to become a classic." David Schneider, brooksBerry. “Serving as an unexpected and unique focal point for the kitchen, waterfall edge countertops have become a classic. Since wood flooring has become the staple of kitchen design, the waterfall edge creates a beautiful flowing, contrasting connection to the floor. 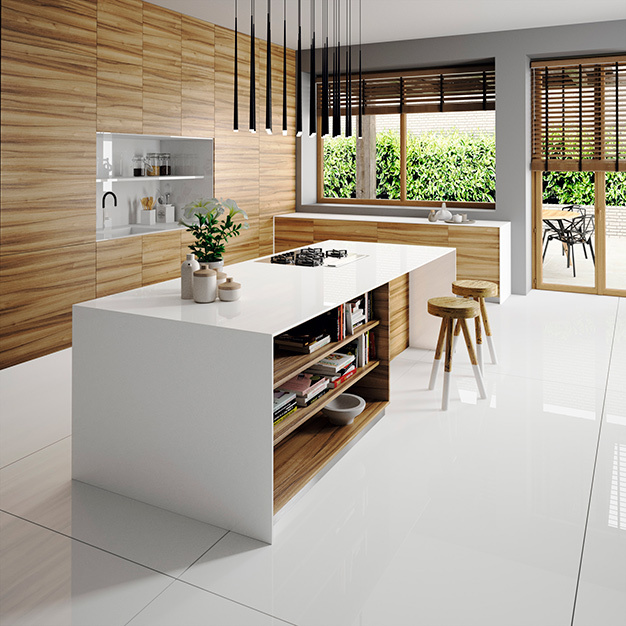 The sleek simplicity updates the traditional kitchen and gives the area a lighter feel. Waterfall edge countertops can be specified in natural stone or man-made materials and the color selection is endless. Concrete waterfall tops, constructed on site, work with many styles, from contemporary to industrial. This classic feature is a must on your kitchen design checklist.” Jane Ganz, Directions In Design. “Classic, if the application is done well and the design supports it. The style fits with a more contemporary, sleek kitchen.” Jim Baygents, National Kitchen & Bath. “It has become a classic over the past few years. There is an array of material options in different thicknesses that allow the veining to seamlessly match the side to the top while the waterfall style gives the kitchen a more chic and sophisticated look. It eliminates the edge for kiddos to hit their head on and acts as a visual break if using contrast colors on the cabinets." Amy Herman, brooksBerry. “I think the waterfall edge will remain a classic. My first inclination was to call it a trend because we have seen so many recently; however as it is always done with classic stone, it is not a style that I believe will expire anytime soon. My word of advice would be to make sure you love the stone you specify for a waterfall edge because you are using a great deal more of the material and certainly making a statement with it!” Emily Koch, JCR Design Group. “The waterfall edge on countertops is a classic look that will be here to stay. This look goes great with any sort of style, whether it’s traditional or contemporary. These types of edges create focal points in the room and become a piece of art. Not only are these a ‘wow factor’, they are also really practical. You typically will find this type of edge on an island, which seems to be the central area everyone gathers around, so having the waterfall edge provides protection against scratches, spills, etc. to your cabinets.” Candice Wideman, Youtopia Designs. “Waterfall edge countertops are style statements and are a design classic! They allow you to showcase your stone selection like a work of art as they create a big impact, especially if you have a small space. A waterfall edge that flows down both sides also bring symmetry and balance to your island. As a practical reason, the side panels aren't as susceptible to scratches, spills and splashes, especially from children or pets.” Gigi Lombrano, Gigi Lombrano Interiors.